Why does internet signal always get unstable? Part I : A slient change happening on RJ Jack & Plug contact area NOW. The modular Jack RJ45 is originally designed to load the wire pins(round pin) with 50μ”gold plated on the whole contacts. Today, over 90% RJ’s contacts were changed to stamping contacts (the so called flat pins) for cost saving and more efficient assembling. The plating process of stamping contact is the selected gold plating. It is to plate 1-3μ” gold on this flat contact first, then plated the 50μ” gold on the contact area(to mate with plug). This is the way to save a cost of gold when the gold price jumped up. 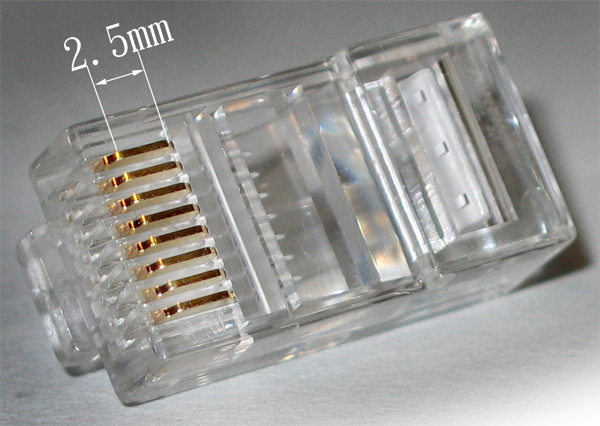 Before year 2000, the RJ manufactures still kept plating high gold on 2.5- 3.0mm of contacting area, in order to match the RJ45 plug contact length of 2.5mm. This used to being the standard spec implemented by all the plating plants. Even if you want to narrow it into 2.0mm only, it will be rejected by plating plant definitely. Somehow, the thing is changed. May be, it was because the gold price jumped from US800 to 1700/oz. during 2008-2012. Now a day, most of the jacks were plated 50μ” gold of 1.0-2.0mm only on the contacting area that was shorted than the plug contact length(2.5mm) a lot. The performance is affected absolutely. What even worse is that design of plug’s contact has been changed silently. Here are the pictures of plugs that you can easily find them in the internet. Their contact positions are dramatically different. Some of them are close to the edge of crystal housing; but some of them are not. This distance difference can be 1mm or more. You can image how chaos it goes when the following plug mated into just 1mm 50μ” gold plated Jack. The plug may not contact at the 50μ” gold area of the Jack. It will just contact on the 1-3μ” area that may be oxidized after 6-18months and cause a series of signal problem. You may want to know why such a silent change and spec chaos happened. One of results came from the internet price competition. The factories never told you how they saved the cost and earned the money back. To a buyer, they may save US0.01 or even just 0.001, but the life /performance of the machine will drop after 6-18months, once these jacks are installed on the machine. A good 50μ” gold (2.5-3mm) jack is able to offer you a life of 5-10year. It is not wise deal to save US0.01 by dropping your product's life from 5years to 6-18months. You may ask again why not go back to the round pin design. With higher speed data transmitting requirement day by day, round pin design had gone to the limit at this moment. The flat pin provided more contacting surface for data transmission. 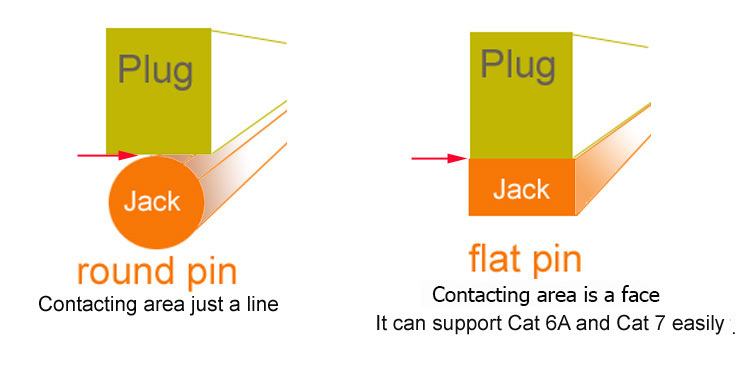 Especially for Cat 6A and Cat 7, almost all of the Jack are flat pins design now. This trend is unpreventable.
" Where to find right RJ jack with 2.5mm-3mm 50μ”gold plated? " when no one tells you the truth. You may go to Zugo Electric mall ( www.zugonow.com ). They cooperate with TIPO LAB in Taiwan and China to block the unreliable products. Only right products (such as 2.5mm-3mm 50μ”) are allowed to be shipped out. Cigarette Butts Turns into Bricks! ?